"I'm bitter because we had lives in Cyrodiil." "Well, we have to cut down something!" "Maybe we should just admit that this is a horrible place for a mill." Ganna Uriel is an Imperial lumberjack and miner found in Kynesgrove and the Steamscorch Mine nearby. 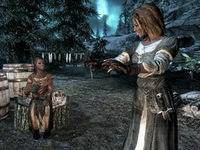 Ganna and her sister, Gemma Uriel, came to Kynesgrove to start a lumber mill but after the mill was finished they found out the trees were sacred, and they were not allowed to cut them. Losing all their money in building the now useless mill, they earn a living by mining at the Steamscorch Mine in Kynesgrove. Ganna will buy firewood for its full value. In order to pay the debts from the failed lumber project, Ganna reluctantly works the mine with her sister, and hacks away with her pickaxe every day between 8am and 5pm. She eats two one-hour meals a day, at 7am and 5pm, at the Braidwood Inn. Like most other residents of Kynesgrove, she sleeps in a tent in the neighboring camp, every night between 10pm and 6am. At all other times she wanders around the camp or spends time at the inn. Ganna wears a set of farm clothes with a pair of boots and gloves. She carries an iron dagger and a selection of lower-class items and gold. 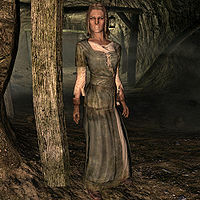 When you approach her, she will tell the full story through her greetings: "Seen the remnants of the grove? That... well, that was me. Me and my sister. ", "Came here to start a lumber mill. Who knew the Nords cared about a bunch of old trees? ", "But... well, they did. Sacred, they said. So we work the mines until we've worked it off. Fair enough, I guess." When asked why the mill never worked out, she will explain: "We got the mill up and running before we found out that the big stand of trees on the hill was sacred. Now we can't cut them, and can't afford to buy another mill somewhere else. So we scrounge whatever we can from around the tundra." Gemma: "I'll never understand why you're so bitter about everything." Ganna: "I'm bitter because we had lives in Cyrodiil. And we came out here to be paupers." Gemma: "But we choose our own path now." Ganna: "And a whole lot of good that's gotten us." Gemma: "There is some good news though. I think the borders of the shrine may be smaller than we think." Ganna: "Wait, so you think we'll be able to harvest some of the sacred trees up there?" Gemma: "Well that's just it. Some of them might not be sacred." Ganna: "I'll let you explain that one to the Nords." Gemma: "They have to be reasonable about it at some point." Ganna: "Gemma. This town is called 'Kynesgrove.' That stand of trees is Kyne's Grove. You don't honestly think you can just cut some down." Gemma: "Well, we have to cut down something!" Ganna: "Maybe we should just admit that this is a horrible place for a mill." 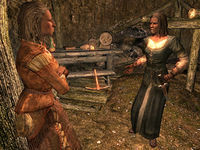 Ganna: "What about Ulfric? Did you ever hear back from him?" Gemma: "No, but his housecarl sent us a letter." Ganna: "Why didn't you tell me? What did he say?" Gemma: "He... thanked us for contacting him, but said they didn't need any more lumber at the moment." Gemma: "You see? That's why I didn't tell you!" Gemma: "We've got a new order in." Ganna: "Is that a joke? " Gemma: "No! Roggi and Kjeld need some more support timbers for the mine." Ganna: "I suppose Kjeld asked for the usual discount?" Gemma: "Well, he is the mayor." Ganna: "No, it's fine. I don't mind being poor." Ganna: "That last brigade of soldiers said there's a tall forest on the eastern edge of the White River." Gemma: "Yes, but that's too close to Mixwater Mill. We don't want to get Gilfre angry at us by stealing her trees." Ganna: "Well we have to harvest somewhere! This is getting absurd." Gemma: "I want to make money just as much as you do, but we don't want to make the Nords angry." Ganna: "Who could tell the difference?" Gemma: "Did I tell you I got a letter from General Tullius? They've conscripted some more archers and will need..."
Ganna: "Sssssh! That's not something we want everyone to be hearing." Gemma: "Oh, like the sleepy rebel supporters in this town are going to tell anyone." Ganna: "Let's just not take the chance. We can talk about this later." This page was last modified on 4 August 2014, at 13:47.